Getting a hoop in your backyard is more than just about basketball, it is an investment in your child’s happiness. Some of my fondest memories growing up was playing one on one with my dad on our driveway. This is why I always say that every family needs to have a hoop (even if they have toddlers, as we describe in our Best Toddler Basketball Hoop article)! Today we are going to look at the best basketball hoop for your home. We’re going to take a look at some of the best hoops you can buy. Some of these have achieved a legendary status while the others are hidden gems known only to a select few in the amateur basketball community. If you have your mind set on purchasing an in-ground hoop, check out our blog posts on the Best In-Ground Basketball Hoop: Reviews And Complete Buying Guide. 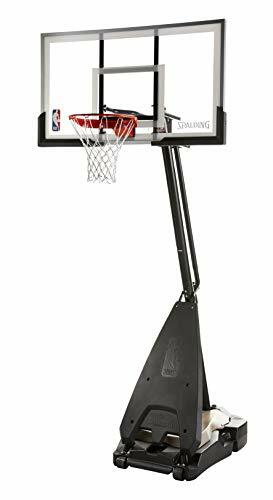 Starting with the legend of driveway hoops, this is one of the best basketball systems you can ever buy. If you are looking for a basketball rim that is extremely stable but is not cemented to the ground the GS54 should be your only option. The main pole gets bolted to the ground with screws. This gives the system extreme stability while maintaining some portability if you decide to switch homes. Installing it can be kind of tricky and unless you have some help I’d recommend hiring someone to do it for you. When I first installed it for a friend, we needed 3 people to hold the pole upright while a 4th friend worked the bolts. But once you install it, the ring plays just like a regulation hoop. My friend has had his GS54 for the last five years, and we have slammed and ripped at it every year, and It is still as good as new. This is because the system comes with a breakaway rim( the same kind you see in the NBA) so even if you dunk like Shaq this ring ain’t breaking. The problem with most portable systems is that they prioritize mobility over what really matters – being fun to play basketball. Luckily for us, Spalding has created a unique hoop that focuses on all the right things. The system is built with the primary focus of supporting aggressive use. So you can throw down all those monstrous dunks without having to worry about wrecking your rim. The acrylic backboard is very stable and is not one of those where every bank shot goes in. The Acrylic Backboard begins to look duller with time as it collects scratches, but this is something you’re going to see with every other backboard of that type. Are you looking for a basketball system for some family fun, that won’t cost you a fortune? This lifetime 1269 system might be the right solution for you. It is not too heavy on the wallet and comes with a ton of useful features that you usually don’t get at this price. Being a portable system lifetime has clearly focused on keeping mobility as a priority. This means the system is really easy to set up and you can even do it all by yourself in a single afternoon. 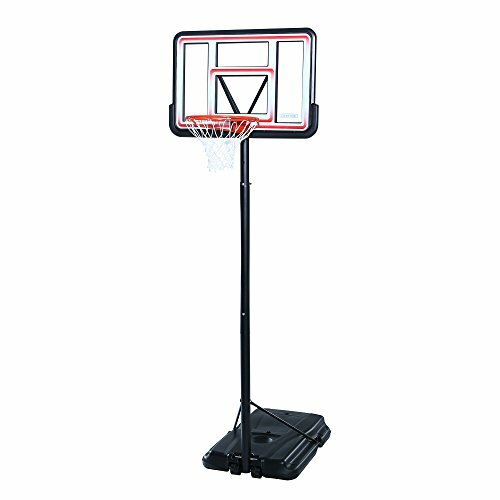 Giantex Portable Basketball: It Is Ideal For Playing Basketball Outdoors With This Full Size Basketball Hoop. Adjust Height: The Height Of The Pole And The Rim Can Both Be Adjusted. When Adjusting The Height, The Holes (4 In The Poles And 5 In The Rim Bracket) Need To Be Aligned To The Rotary Knobs. Steady Base: The Base Can Be Filled With 66 Lbs Water And 88 Lbs Sands To Keep It Upright And Stable. Last Long Using: Durable Steel Frame, Impact Backboard Is Virtually Unbreakable. 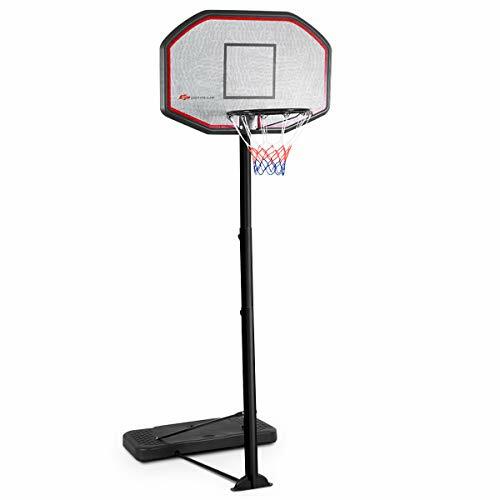 Suitable For Daily Use: This Item Is Perfect For Playing Basketball With Your Neighbors, Friends Or Family Outdoor Or Indoor Due To Its Easy Portability With The Attached Wheels. If you have never heard of this company. I don’t blame you. In an industry dominated giants like Spalding and Nike, Giantex is the dwarf looking to make a name for itself. They have carved a niche for themselves by selling budget friendly hoops that focus on affordability. The base can be held down with 88 pounds of sand so it will stay relatively stable. Very very easy to set up. This is one of those systems you take out when the kids want to play and put it back in when they are done. The 90020 is a great option as a first rim you can buy for your kids. Compared to the other in-ground hoops, the stability of this system can be a bit disappointing. The rim will rattle for a few seconds especially after a long-range shot. But you can’t expect much more at this price point. 1 Inch thick high impact outdoor safety Pole and Gusset padding included! This is where things get real. The pro dunk Hercules is the Lamborghini of basketball hoops. It’s one of those rims Kobe probably has at his home. It comes with an NBA size 72″ X 48″ backboard made from thick 1/2″ tempered glass. No other system you buy is going to give you these specifications. Pro Dunk, the company behind this board has gone all in to create the ultimate system. In fact, they are so sure of its quality that they offer a lifetime warranty which includes dunking and hanging on the rim. The pro dunk is a great way to go if you have the space and are looking to play professional style basketball on a hoop that’s will last for the rest of your life. If you don’t have much space, it makes sense to get a hoop with a smaller overhang or even a wall mounted system. This way you don’t reduce the size of an already small space. 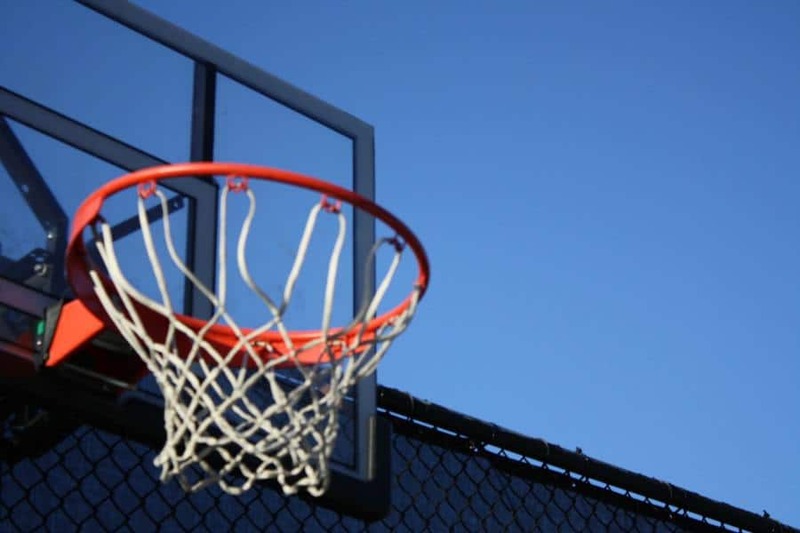 What are the rules in your neighborhood about basketball hoops? If you are planning to purchase a hoop for your background make sure that you are legally allowed to do so. Many neighborhoods don’t allow residents to install certain structures that may cause a disturbance to the community. You don’t want to spend a ton of time and money to set up your system and then get a notice asking you to remove it. Ask neighbors who already have a hoop installed about any rules you need to follow. If none of your neighbors have a basketball hoop, ask someone who is actively involved in the community. Do I Need Height Adjustment? Almost every hoop on this list (except the pro dunk) supports some kind of height adjustment. 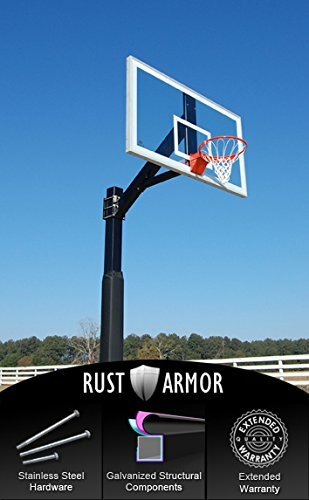 This works great for kids who don’t have the strength to shoot at a 10ft rim. It is also super useful if you are planning to host a dunk contest anytime soon. But rims with height adjustment generally cost a bit more and also have a degree of instability. This is why the best hoop on this list does not have any height adjustment. Whether you want height adjustment or not depends on your personal preferences. If your kids are young, I’d say go for a rim with some kind of height adjustment otherwise you’re better off with a fixed height rim. How to Select the Right Backboard For You? There are many factors you should look at when selecting the right kind of backboard for yourself. Things such as the size of the backboard or the material will really depend on the price of the system. The backboards you see on TV or during college games are 72 inches wide and 42 inches high. But these mythical backboards weigh a ton and you are going to need a full team of players just to set it up. They are also super expensive. 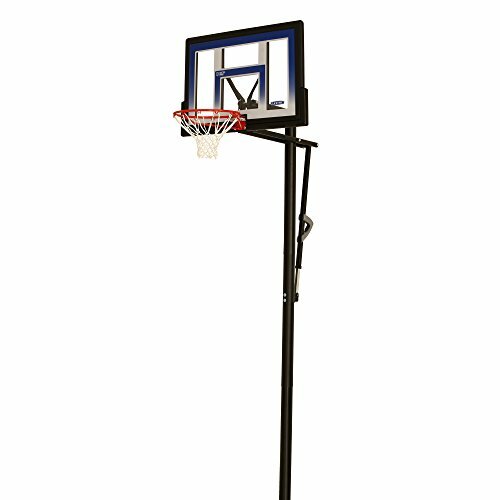 This is why most backboards you buy will be around 60 inches wide, a budget hoop like the Lifetime 90020 has a width of only 48 inches. But there’s no need to spend a ton of cash on a 72-inch backboard. Most backboards provide enough space for layups and bank shots. The 72-inch boards are only necessary if you’re training professionally. The kind of backboard you get with your system will depend primarily on its price. There are 3 major kinds of backboard materials. You have probably seen these kinds of backboards on entry-level hoops. Mostly because they are very cheap to make. However, polycarbonate backboards are pretty durable and relatively light especially for something so cheap. This makes them a good option for portable basketball systems. But the biggest problem with polycarbonate is that the rebounds don’t feel right. When the ball hits the backboard, it just falls down rather than bouncing off the board. This may be a problem for people used to playing on high-quality rims. Another point to note is that if you own a polycarbonate board for long enough you will notice a yellow tint. This is because polycarbonate gets discolored when left out in the sun. Spend over $200 on a hoop and you’re likely going to get an acrylic backboard. They provide a much better rebound response than polycarbonate. The ball bounces much further when it hits the board but not as far as in a glass backboard. A problem with acrylic is that get scratches with time and being to look dull. Tempered glass is used as backboard material in the NBA and NCAA. It is also super expensive that’s why only the most expensive systems even use a tempered glass backboard. The NBA uses a backboard that is half an inch thick, like the one in the pro dunk. The main problem with playing on anything other than tempered glass is that bounce is not strong enough. This means bank shots are much more likely to go in. While it doesn’t seem like such a big deal, it’s going affect your child’s game and stuff like this might happen. One of the major problems with tempered glass is their weight, so if you are looking for some kind of portability. This may not be the choice for you. Do Tempered glass backboards break easily? There’s a very popular myth that tempered glass backboards have a high chance of breaking and drown you in a shower of glass. This is just not true. While it’s true that early backboards in the 70’s would break if someone dunked too hard. The new technologies used in the rims these days have made them much safe(you are more likely to break the pole than the backboard). The overhang is the distance between the backboard and the baseline. The advantage of having a large overhang is that it allows you to play the game without worrying about crashing into the pole. One of the major problems we have with portable rims is the fact that there is almost no overhang. In fact, some portable system even has the support creep into the court. On an official NBA court, the distance between the baseline and the backboard is 4 feet. Cheaper hoops like offer a small overhand. However, depending on the size of your driveway this can actually be an advantage. The more expensive hoops like the Pro Dunk offer an overhang of up to 4 feet and allow you to play under the rim without worrying about injuries. What should you look for in a Rim? Almost all the basketball hoops these days come with breakaway rims, a breakaway rim make sure that the ring doesn’t break when being dunked on. They also absorb the impact of the shot much better. If the system you are buying as a breakaway mechanism, make sure that the springs are covered. Otherwise, your springs will rust pretty quickly. If you are a keen reader, you might have noticed that there’s no wall-mounted rim on this list. That’s because wall mounted systems are really noisy. You are going to hear every single shot that hits the backboard inside your house. I really don’t recommend a wall-mounted hoop unless you have a really small driveway. The biggest advantage of getting an in-ground hoop is that it allows your kids to play under the basket without worrying about getting hurt by running into the pole. One of the many problems people have with in-ground systems is that you cannot take it with you when you move homes but with some clever planning this should not be an issue. Put your pole in a sleeve as you lower it into the ground. This will allow you to move the rim when you switch homes. 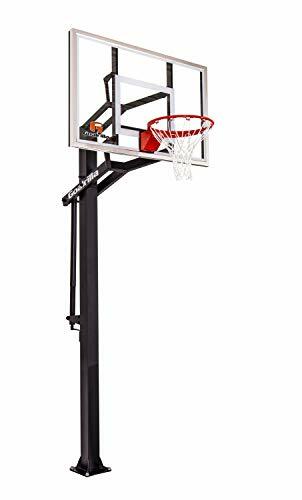 If your kids are going to be playing mostly in the gym or the park and will only use the rim at home to practice their shots, I’d say you should go with a portable system. This should be the ideal situation for most people as kids tend to play basketball in the gym after grow older anyway. You should try to buy the first type as far as possible. The problem with the second type of system is that it creeps into the playable area and some even end just under the ring. This increases the chance that your child could trip and hurt themselves on it. Spalding is the largest sports equipment manufacturer in the world. They invented the modern day basketball and are also responsible for creating the hoops used during official NBA games. Is it any surprise then that Spalding creates the best basketball systems in the world? They even help push the innovation of the basketball rim with a dedicated R&D team focused specifically on creating a better hoop system. Pro Dunk has been manufacturing basketball hoops for the last 34 years. They are a family owned business with a primary focus on creating the best basketball rims you can ever buy. This is why they don’t cut costs. They even sell directly to the manufactures to keep the cost of their good manageable. Why does my system vibrate so much? for the first problem check out other reviews for your product see if other owners are having the same experience. If this is a common occurrence, there’s not much you can do. However, if you are the only one facing an issue with the system it is likely that there’s an issue with the installation. Portable Systems: make sure there’s enough weight in the base to keep the system stable. Goalrilla Systems: Take a look at the bolts, are they tight enough to support your pole? When you purchase a basketball hoop you are required to fill it with some kind of base. This helps keep the system stable. The kind of filling you choose is very important as it decides if how you well your hoop plays. If you don’t put enough weight in then there’s a chance some strong wind might topple the entire ring but if it’s too heavy you’re not going to be able to move it. Or worse it will damage the base. One of the most common ways to fill the base of a basketball system is to weigh it down with water. After all, water is easily accessible and free. But if you are using water as a base for your system remember to empty it during winters or the water will freeze and damage the base. One way to prevent this is by mixing the water with salt. While water weighs just 8 pounds per gallon, sand is a lot heavier at 13 pounds per gallon and considering that most bases hold up to 35 gallons. You get over 450 pounds to support your system by just using sand. Another cool thing about using sand is that when you base cracks you can notice where the crack is located and the sand will not leak out like water. However, the cost of filling the base with sand is more expensive and it makes the system really heavy. This becomes a problem when you want to move it later. Some of the major problems with using water as a base is that water may leak when the base cracks or freeze during winters. 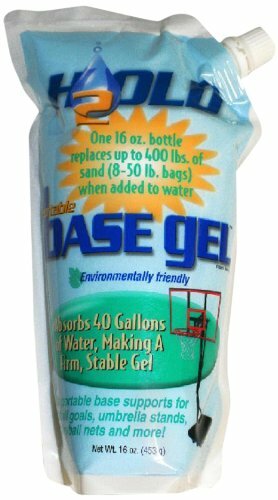 You can now use a product called basegel which makes water into an extremely efficient base. Basegel converts water into a thick leak proof gel and reduces its freezing temperature. You can even turn the gel back into a liquid by adding salt making the base easy to drain as well. I’m personally more of an in-ground hoops guy but there are also a ton of people who have bought high-quality portable hoops and are extremely happy with it. If I had to do it again I would purchase a Pro Dunk Platinum. Although It might seem silly to spend $800+ on a basketball hoop when you kids aren’t basketball phenoms but think of it as a long-term investment. Want more? Read here about other backyard games you can play.